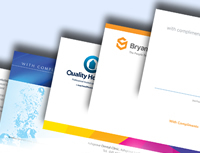 Competitive recyled compliment slip printing, full colour compliment slips printed at trade print prices and dispatched on a next day courier service to England. Competitive recycled compliment slip printers of compliment slips and business stationery, printed at very competitive printing prices. Competitive printers of business stationery to England. Full colour one sided recycled bond paper. compliment slip, printed onto 100 gsm recycled bond paper. Free compliment slips artwork proofing and client area.